Join us at the RDC Forum. Coming to a city near you! The RDC Forum 1-Day events are the industry’s only gatherings dedicated to the Remote Deposit Capture Industry. Hosted by RemoteDepositCapture.com, the industry’s leading independent resource for all RDC news, analysis, and information (and the Industry’s de facto trade association), the RDC Forums will help financial institutions succeed with Remote Deposit Capture. These events are open to all indivduas interested in remote deposit capture and its impact on payments. Space is limited at each. Price includes registration for the full day plus event materials. The sessions are approved for 6.6 NCP CE credits. The RDC Forum covers all aspects of RDC, including risk management, mobile deposit, small business RDC, audits/assesments, regulatory changes, etc. Detailed and unique insights from RemoteDepositCapture.com will enable attendees to improve profitability, increase adoption, enhance customer value, reduce risk, and exceed your Remote Deposit Capture goals and objectives. If your financial institution offers any form of remote deposit capture, mobile deposit, etc. and you work in proximity to the event cities, you need to attend. Over 300,000 unique visitors/year trust RemoteDepositCapture.com for independent and in depth analyses of the news, trends and issues affecting the payments industry. Atlanta, GA - April 11, 2019 - Too late! We may schedule another in Atlanta in the Fall. Orlando, FL - May 9, 2019 – Click here to register. Seattle, WA - June 25, 2019 – Click here to register. Ann Arbor, MI - July 22, 2019 – Click here to register. Minneapolis, MN - August 28, 2019 – Click here to register. Chicago, IL - October 15, 2019 – Click here to register. Nashville, TN - October 17, 2019 – Click here to register. Over 300,000 unique visitors/year trust RemoteDepositCapture.com for independent and in depth analyses of the news, trends and issues affecting RDC and payments. This reach provides valuable insight into the topics of greatest interest to financial institutions, solution providers and regulators. The topics outlined below are indicative of discussion topics at a typical RDC Forum event. 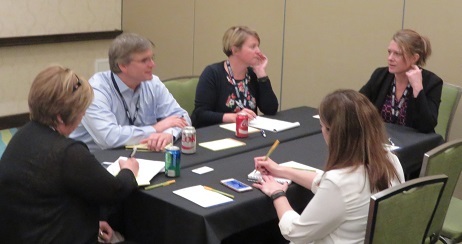 Given the informal and relaxed setting, the RDC Forum truly engages attendees allowing for the sharing of ideas, brainstorming, and collaboration. Pulse on the Market Industry overview and update; the latest trends, issues and insights. Capabilities Benchmarking Benchmark your FI's RDC capabilities across consumer, small business and corporate segments. Solution Spotlight Spotlight presentations on the latest innovations and solutions from throughout the industry. RDC Risk Management Strategies, Tactics, Capabilities, Innovative Approaches, Benchmarking and more. Top 5 RDC Audit Findings & Resolutions Hear directly from an Auditor who's performed dozens of Audits. Team Exercise: Mobile, Small Biz, Corporate Insights An active group competition and networking exercise to develop winning RDC programs for the Mobile (Consumer) and Small Business markets. Planning and implementing a winning RDC Strategy A discussion covering the keys to success for the future or your RDC offerings. Leveraging expertise in RDC compliance and risk management procedures, this session will reveal the Top 5 RDC Audit Findings & Resolutions.